As dawn broke on October 1, the government left some water out for the cat, checked the latches on the windows, turned off the lights and left. Because Congress has been unable to pass a budget or continuing resolution and keep operations funded, we’re now in the fourth day of a government shutdown. With the shutdown, all of the government’s efforts to conduct and fund scientific research — ranging from new energy technologies to river ecology to cancer — ground to a halt. 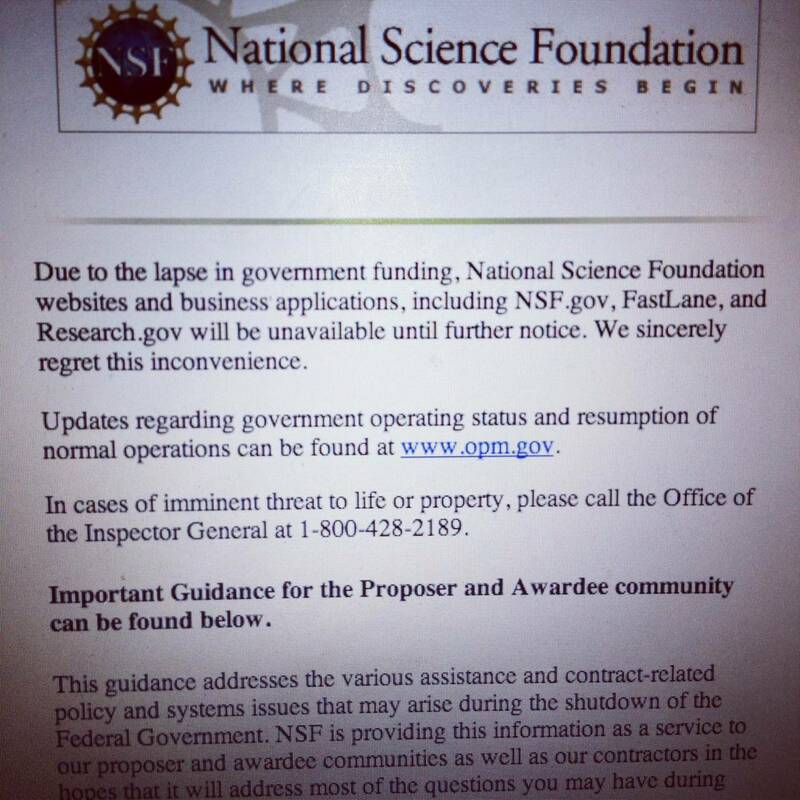 New checks aren’t being cut for funded research, while labs and research centers run by a bevy of government agencies have been shuttered. 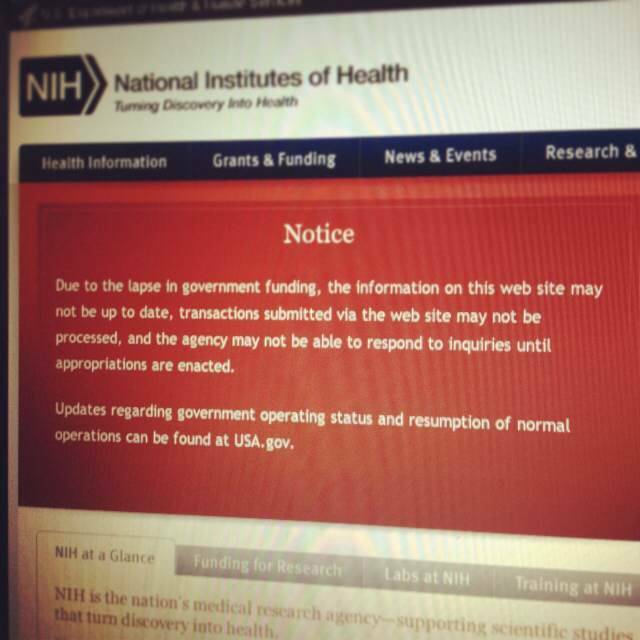 To get a sense of what the shutdown looks like for science from the web’s point of view, I started compiling Instagram screenshots of government science websites, as well as quotes about the impact of the shutdown on science, and posting them to a site I created called Science Shutdown. For today’s Science Small Plate, I thought I’d share a few of those images. 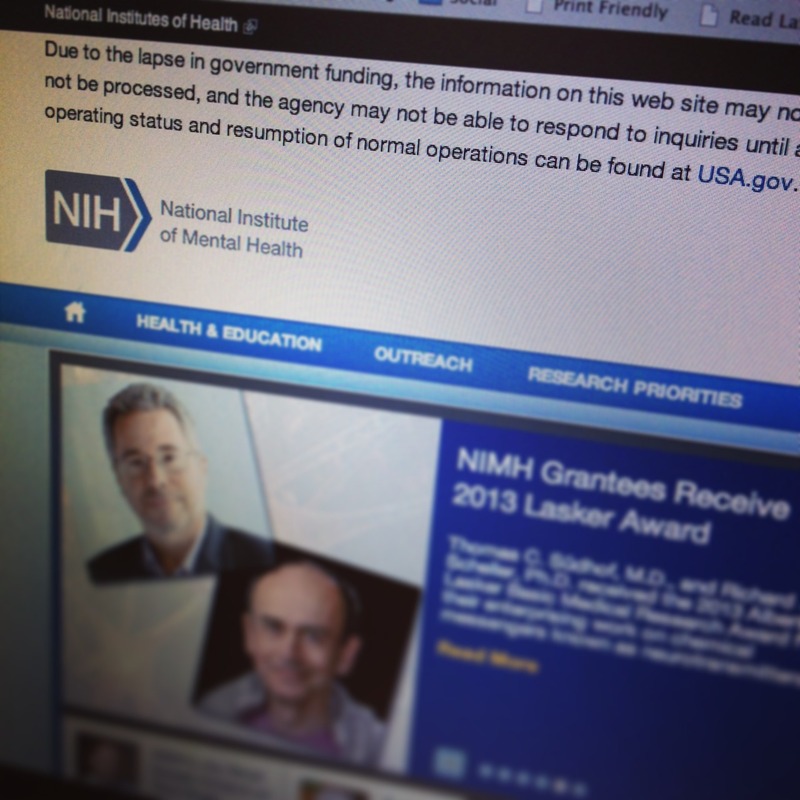 If you look at the websites for the NIH or just about any NIH institute, this is what you see. 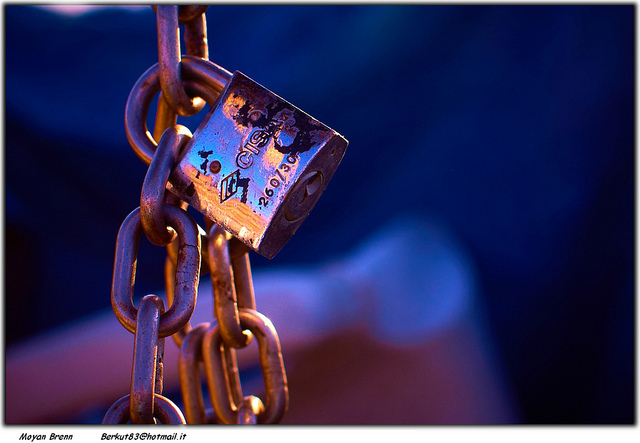 The remaining content is there, but as we all know, web content get stale quickly, and no one is home to keep the sites updated. 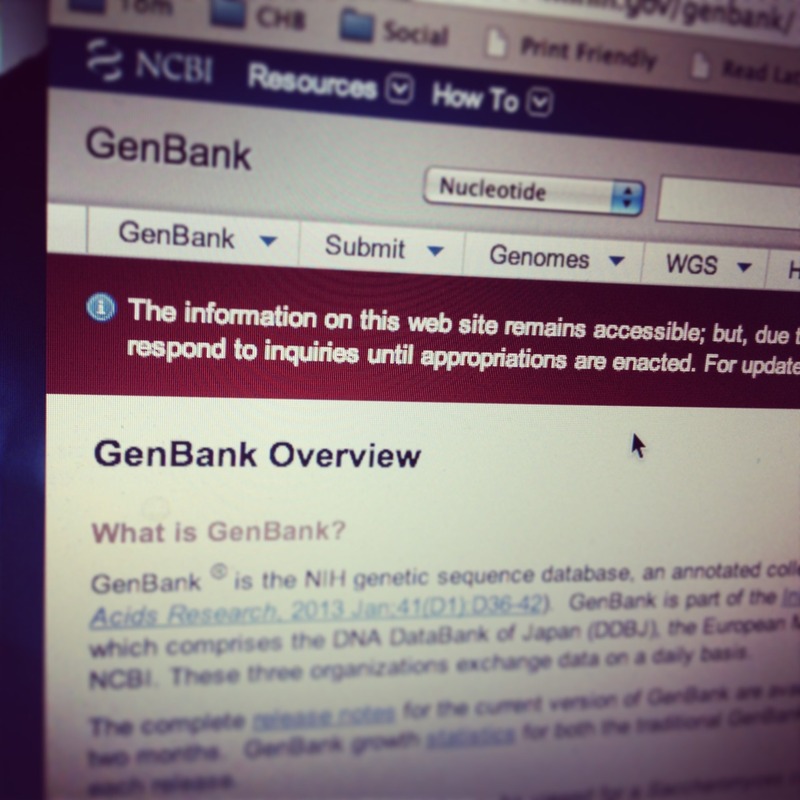 Databases run by the National Library of Medicine like PubMed (which catalogs the biomedical research literature) and GenBank (a repository for gene sequence data) are also on standby during the shutdown. 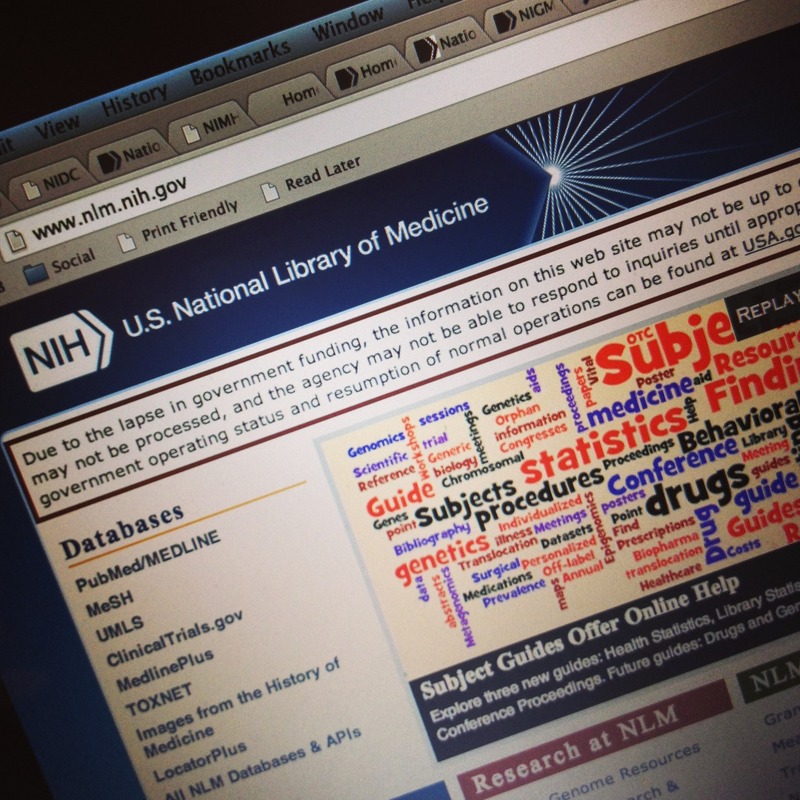 All of their current data is still available, but no new data is being added, which can impact scientists chances of getting new grants or publishing new papers. 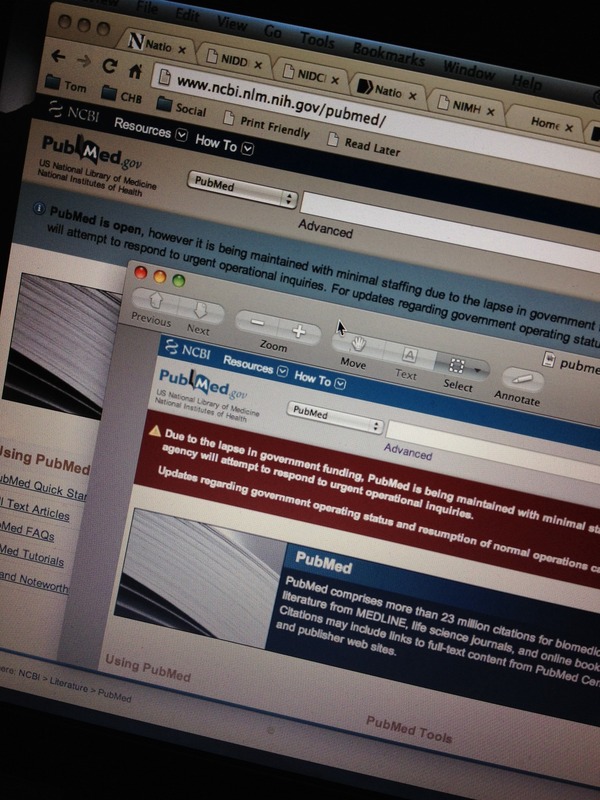 Two views of Pubmed, on 10/1 and 10/2. 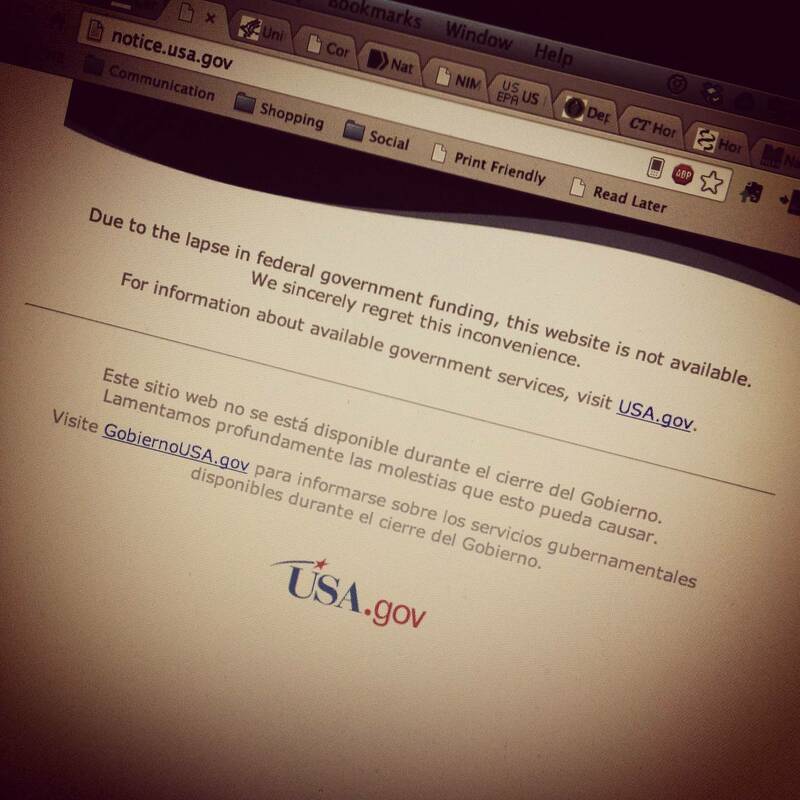 Some agencies like NASA, the US Geological Survey, the USDA, and the National Science Foundation took a slightly more dramatic approach, removing themselves from the web altogether. 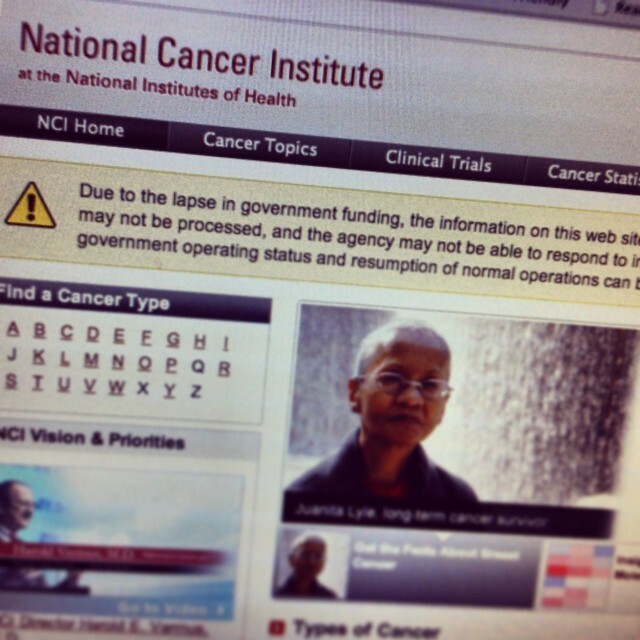 I’m going to keep compiling more images over the coming days, as well as quotes about the shutdown’s impact on science at all levels (funding, patients’ access to clinical trials, safety, research progress, ability to collaborate, etc. 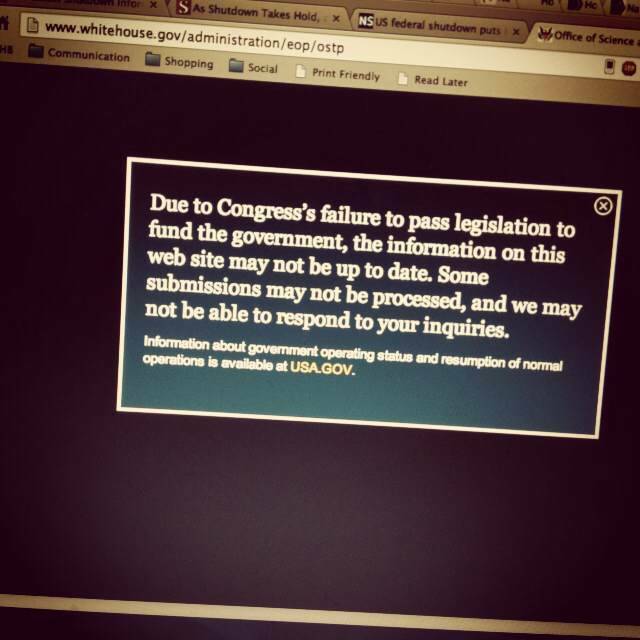 ), at Science Shutdown. Blogger and scientist Jonathan Eisen made a similar compilation on his blog a couple of days ago, too. Want to get involved? Send me anything you think I should include in the comments below, on the You’ve Got Some Science On You Facebook page, or over Twitter. 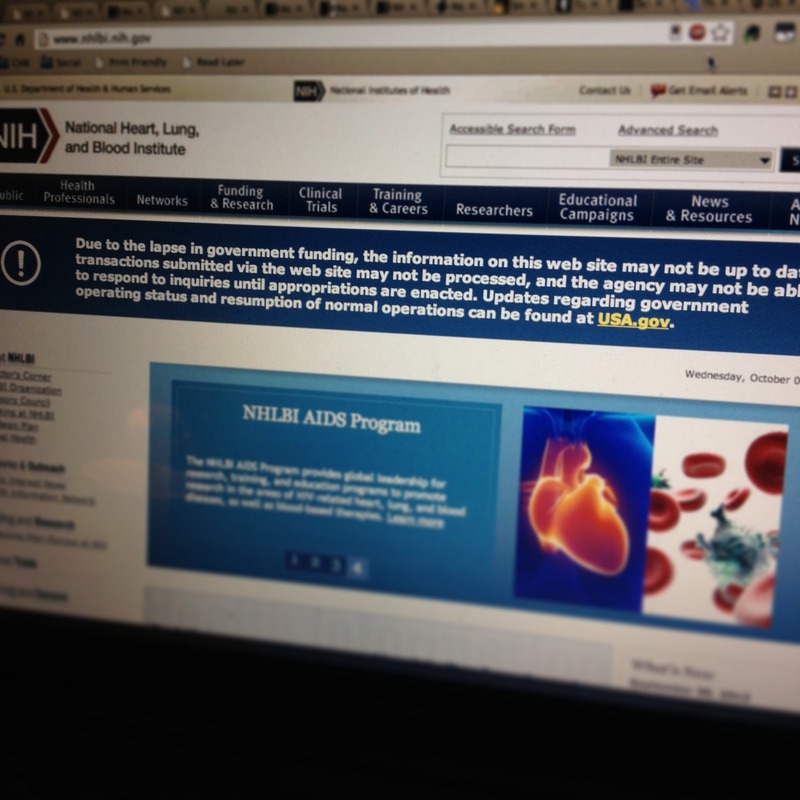 Or you can submit sites directly on Science Shutdown. ← What is this fiber we’re all supposed to eat more of?